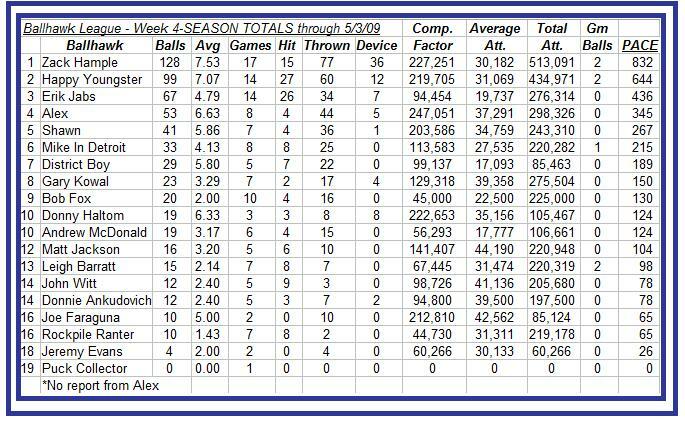 I like that the pace I’m on has me snagging at least 100 baseballs this season… that would be pretty cool. Meanwhile, Zack Hample is on pace for 832 and Happy Youngster is on pace for 644! Thanks, Erik, for putting this all together this year! Also, I have a trip to Busch Stadium planned this season as well as a visit up to Oakland to watch the Angels play the A’s in July. I’ll post another entry after my next ball game. Thanks for reading! Mine is by no means the most impressive of the lot… it’s cool to see the different ways people display their baseballs as well as the people that have helmets, batting gloves, bats, etc. Maybe someday I’ll snag a cool memento like that! Thanks, Zack, for the chance to be featured on your site. 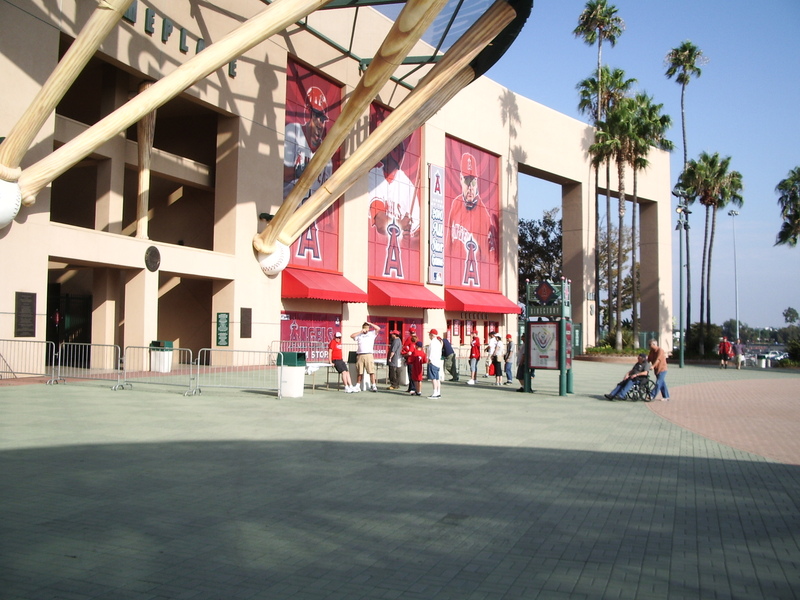 Rain and snow will soon fall in parts of SoCal and the Angels will not add a second championship flag to their stadium. There’s always next year. Not bad predictions, right? I mean, who thought the Rays would be that good? Who knew the Yankees would get that hurt? And who knew the Mets would collapse like that… again? Once the eight teams were decided, I really hoped for a Freeway Series… that would’ve been great! Alas, it wasn’t in the cards. Not even ManRam and/or Big Tex could help the SoCal teams into the World Series. The NLCS… I didn’t care. The Cubs would’ve been fun to watch… and I don’t like the Dodgers. Brewers? Meh… Phillies? “Okay,” I thought. Sure. The AL playoff race… man. I had to leave my apartment after Aybar couldn’t get that bunt down and the Red Sox won that series in four. Ugh. Then I had to choose between rooting for the team that had eliminated my Halos or the team that had manhandled them throughout the regular season. Well, the Red Sox had opened a fresh wound so I was all about the Rays–funny how if you drop “Devil” from your name and change your logo to a flash of light, you win baseball games–and their youthful team. As my friend, Josh, would say, “You get that many draft picks and you’re bound to be good eventually.” They were the underdogs; this year’s baseball Cinderella story. It wouldn’t be a happy ending for the boys from St. Pete. In the end the Phillies had better pitching, more homers, and the experience necessary to hold down Joe Maddon and his kids. I was satisfied. Nothing more, nothing less. Now that the playoffs and World Series are over I can let out all the “whoas” that have been lounging around inside me with regard to the end of the baseball season. I went to quite a few games this year! Roughly twenty… though I really am too tired to look that statistic up right now. I bet I could figure it out. 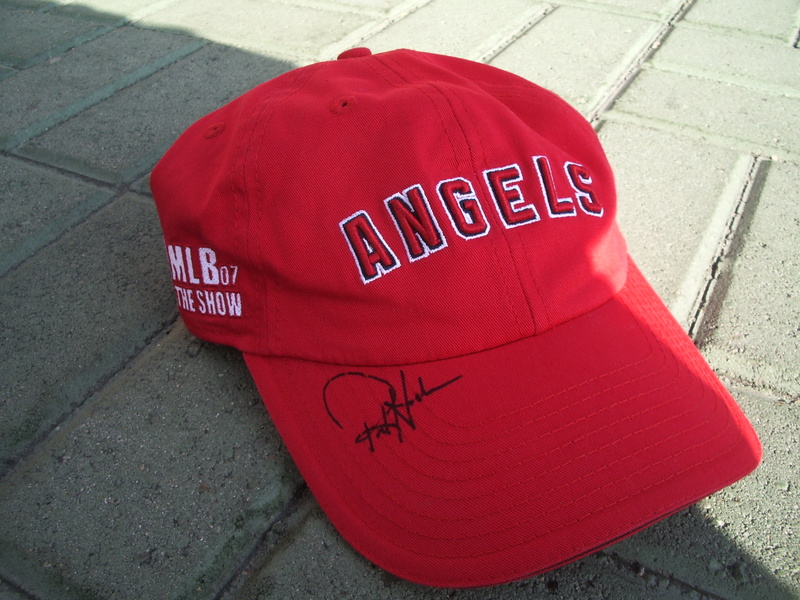 Living in Orange County makes it easy to hit up Angels games. Currently, I live closer to their stadium than I ever have and it feels good to be just a fifteen minute drive from your favorite ballpark. I also visited some new parks this year. Michelle and I watched a game at U.S. Cellular Field and went on a walking tour of Wrigley Field while we were in Chicago… the Cubs were out of town at the time. This is in addition to the one Padres game, two Dodgers games, and many Angels games I saw this year. 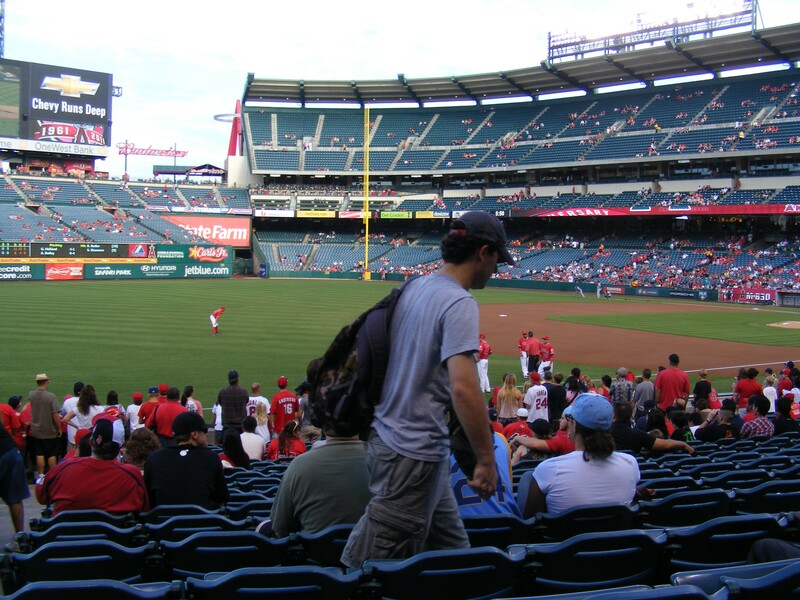 I watched a lot of baseball and I had some fun times at the stadiums. It’s weird to not be able to see the diving catches and home runs on ESPN when I come home. Now there’s all this talk of this other game where you bounce a ball… and one where people get tackled. Whatever. Hmm… good question. I’ve got school to keep me busy… so, so busy. Plus, I’ve got Michelle! We’ve got a wedding to plan. Things are good… things are very good. “Well, sure!” he replied jovially. At 5:05 the Home Plate Gate opened and I (on the advice of Zack Hample) did NOT go straight to the left field foul pole and instead headed for the right field pavillion. A few players were shagging balls out there and I spotted Dustin Moseley and asked him for a ball–I was extremely polite. He told me, “If you don’t get one, I’ll make sure to throw one to you.” OK… a good start. A few minutes later a homer hit some chairs a section to my right and bounced back to the field. Dustin grabbed it and flipped it right to me! YES! 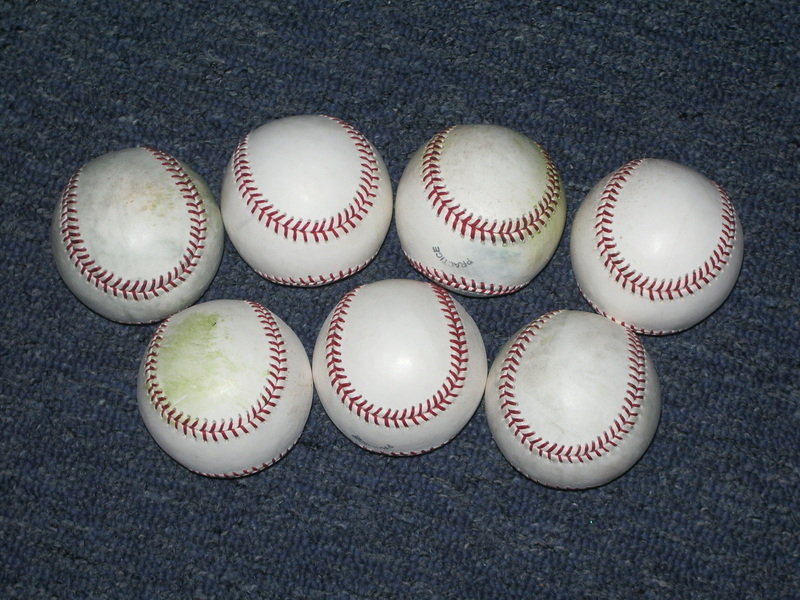 Six consecutive games with at least one ball. 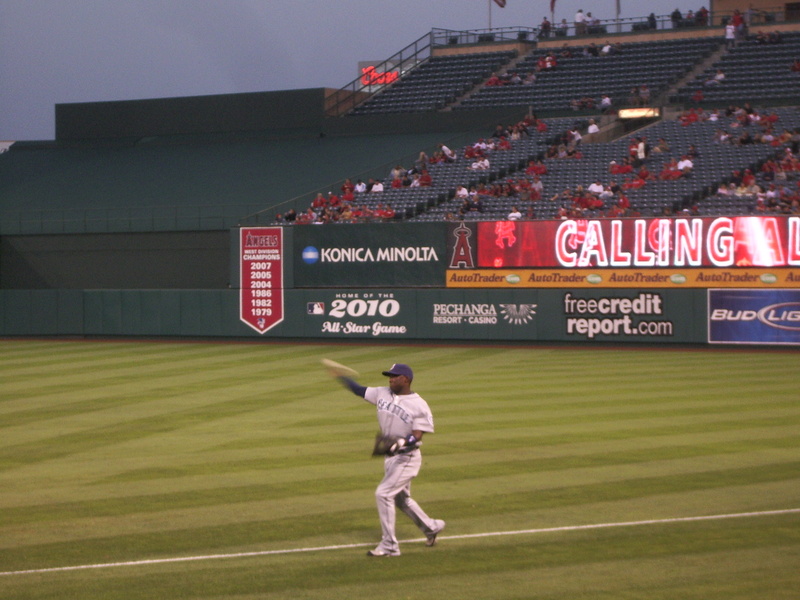 In center field, an Angel wearing number 71 was fielding alongside Dino Ebel (the Angels’ 3rd base coach). I asked him to throw one (from about forty feet away) and he did! Right on the money. Robb Quinlan was batting and hit a blast to the seats that hit some seats to my left. I ran over and caught it on a bounce. I had three baseballs and it was 5:13pm. 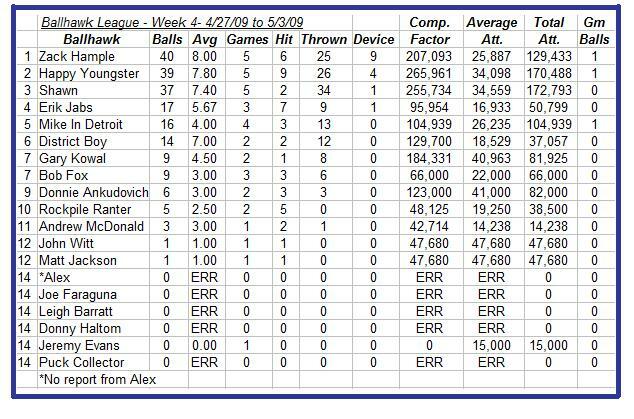 Let me take a moment here to inform you that I had NEVER snagged more than two baseballs at any game… ever. 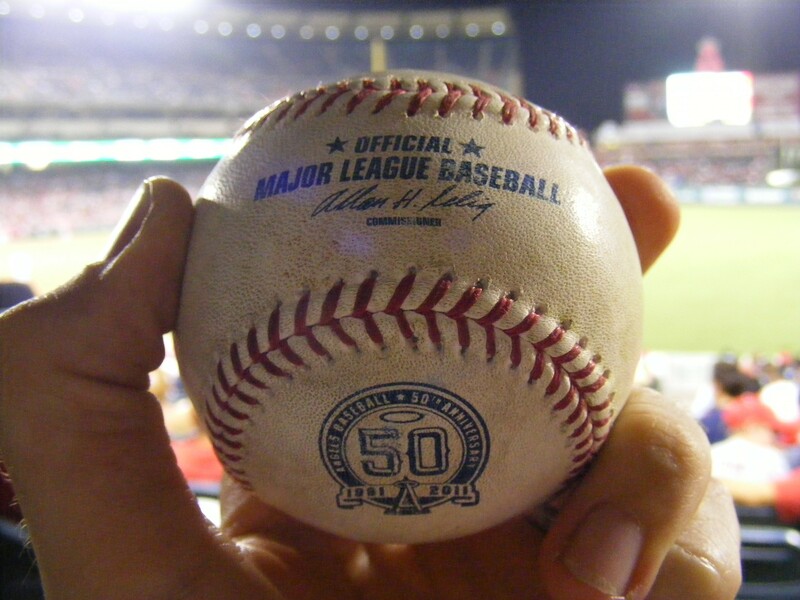 I’d gotten two at an Angels/Red Sox game in 2004, at my first-ever game at Camden Yards in 2007, and twice this season (8/5/08 at Angel Stadium and 9/9/08 at PETCO Park). I had a new, single game record. Well, the Angels finished BP and the Mariners started up. Let me tell you, Ichiro can hit the ball pretty well, at least in batting practice. Though he was wearing a coverup over his jersey, I recognized the facial hair of J.J. Putz and asked him for the next ball he got ahold of. 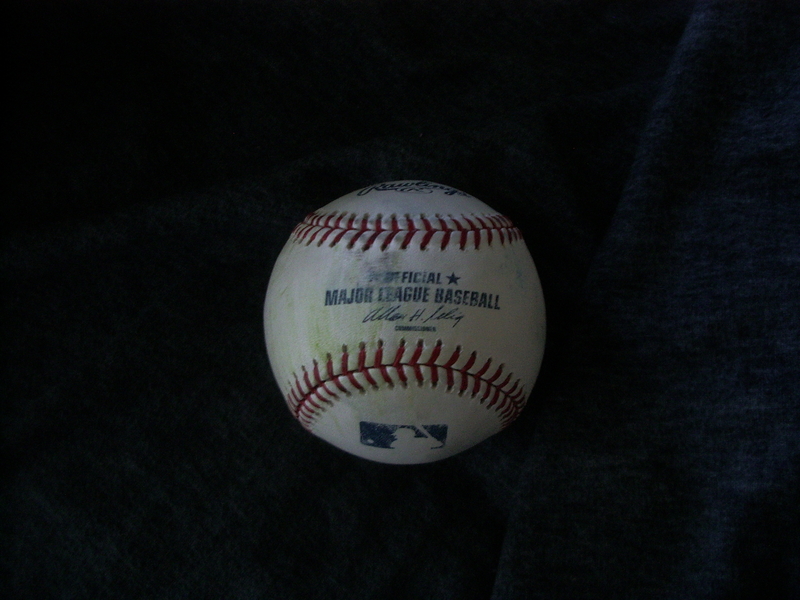 A little while later he got one from another Mariner reliever near him and tossed it up to me. FOUR! Later, a Mariners player wearing the number 89 threw a ball to me and then some righty smashed a ball over the fence and right into my glove. I wish I could have seen who it was… I’m thinking it was Adrián Beltre… no way to be sure. It was just after 6:00 at this point so I headed down to the right field line in the hope that Jarrod Washburn or Putz (who were nearby) would sign an autograph. They told some fans they would, but they didn’t. Bummer. I followed them toward the dugout and sat down for a minute. As I wrote some notes about my adventure, Yuniesky Betancourt started playing catch in front of the dugout. There was hardly anyone around at this point so when he was through I simply said, “Yuniesky!” and stood up with my glove open. He saw me, he threw it. SEVEN! The game was fun! 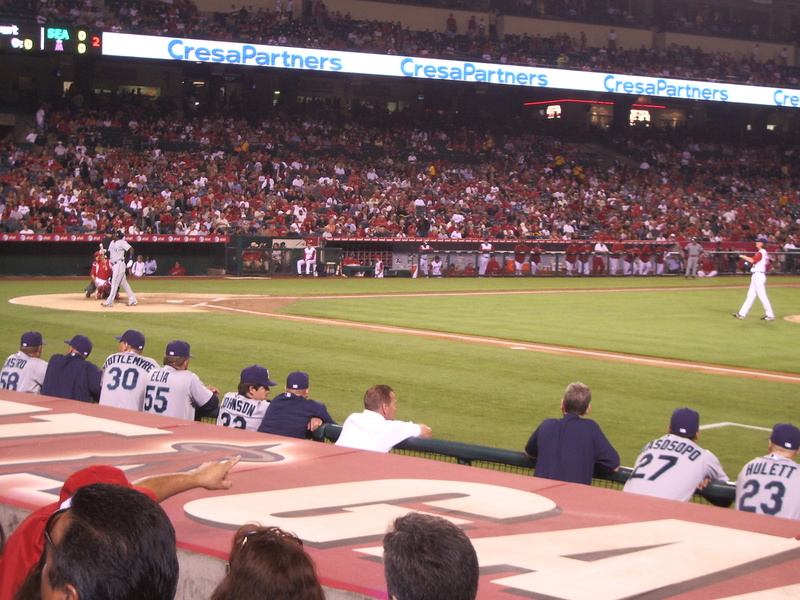 The Angels were ahead 7-0 at one point before the bullpen gave up a few runs. Most of the fans had left early (while I tried, unsuccessfully, to play the dugouts to get a 3rd out ball) thinking it would be a blowout. Well, with men on and the score 7-3 in the ninth K-Rod came in. He had 56 saves. Boy, I’m gonna miss him when he’s not an Angel anymore… but he will make a LOT of cash somewhere. He let a run score, but notched save #57 on the year, tying the current record (set by Bobby Thigpen in 1990). Let this be a reminder, fans, don’t leave a game early! You might miss something great! He got interviewed for FSN West by Michael Eaves. I’m hoping he’ll break it this weekend. Also, I stayed after the game a bit to see if any players would sign autographs as they exited. They didn’t, but I experienced this little exchange as Frankie Rodriguez was leaving the park in his very, very nice car. A dozen of us (Angel Fans): There’s Frankie! Hey, Frankie! Congrats! F.R. : Thang you, guys. Gracias. Us: You were great! Are you gonna break the record? F.R. : Hey, c’mon. You know iz gonna happen. 1. I had the chance to hang out with my buddy, Josh, at a ball game. 2. I was trying to extend my baseball streak in a new venue. 3. 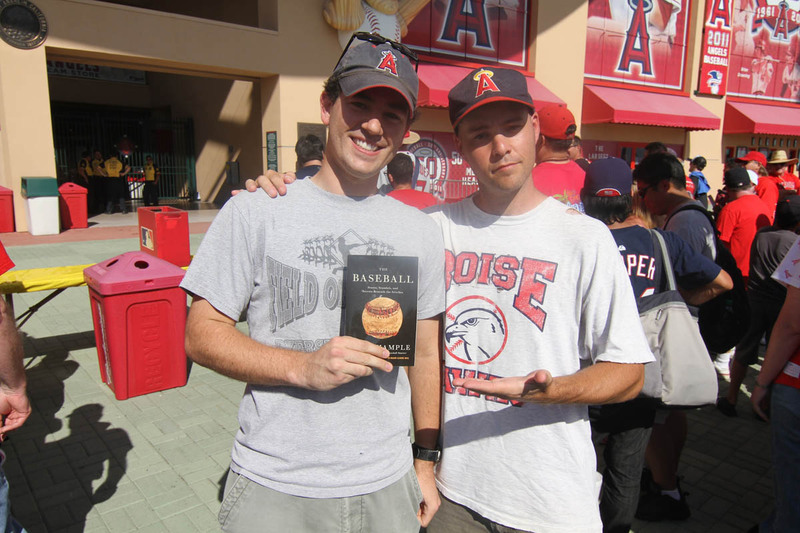 I was hopefully going to meet Zack Hample and get him to sign a copy of his book for me. 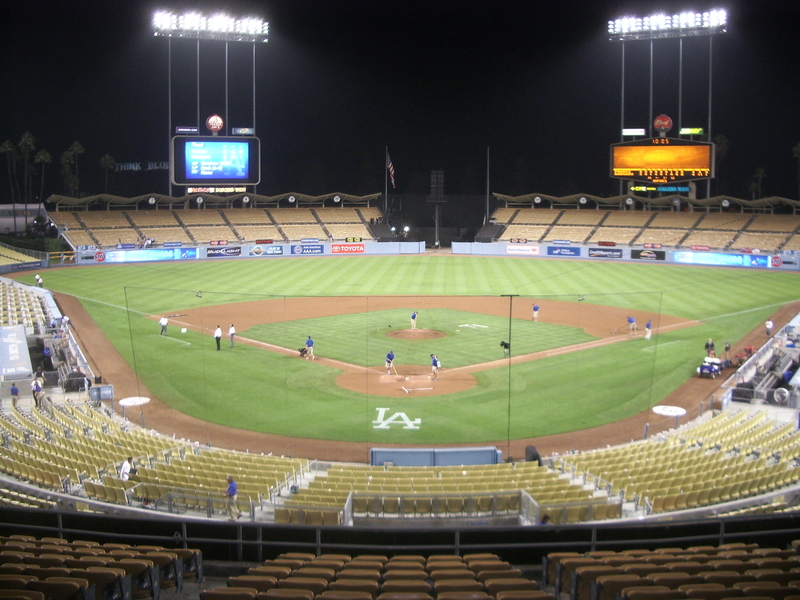 Here is why I was not excited about this game: It was a Dodger game at Dodger Stadium. Allow me to explain. I’m not a Dodgers fan… I have nothing against the team. They’re a good team. I do, however, have an issue with Dodger fans (and I’m generalizing). Mostly, they are OK… but I can’t ever go to a Dodger game without the sneaking suspicion that I might, just might, get shanked in the kidney by some drunk, illiterate tool that can’t handle the fact that his (or her) team might not win every single game. I’ll give you an example of a Dodger fan at his worst in just a bit. 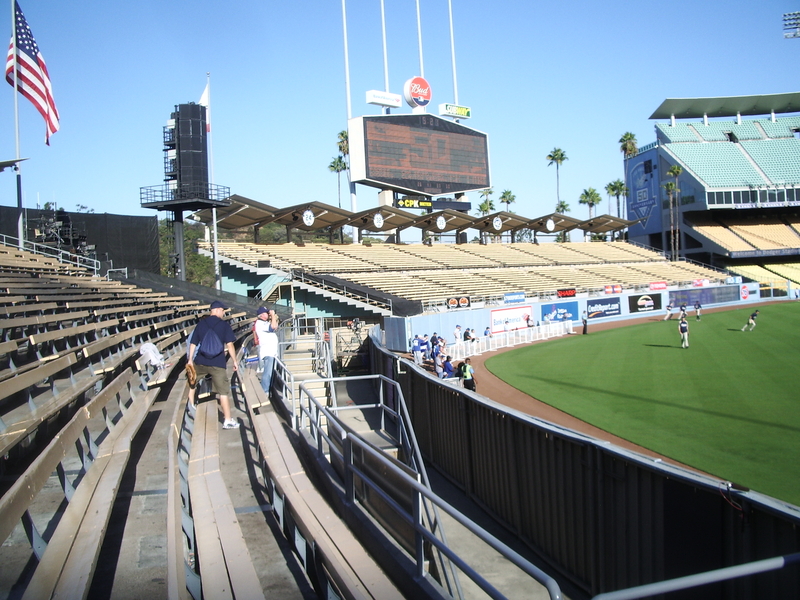 We played catch, ignored some dudes trying to sell imitation Dodgers gear, chatted, offered to let a kid throw the ball once (and he did… right down a hillside.. he was only six years old)… and then the gates opened at 5:10. 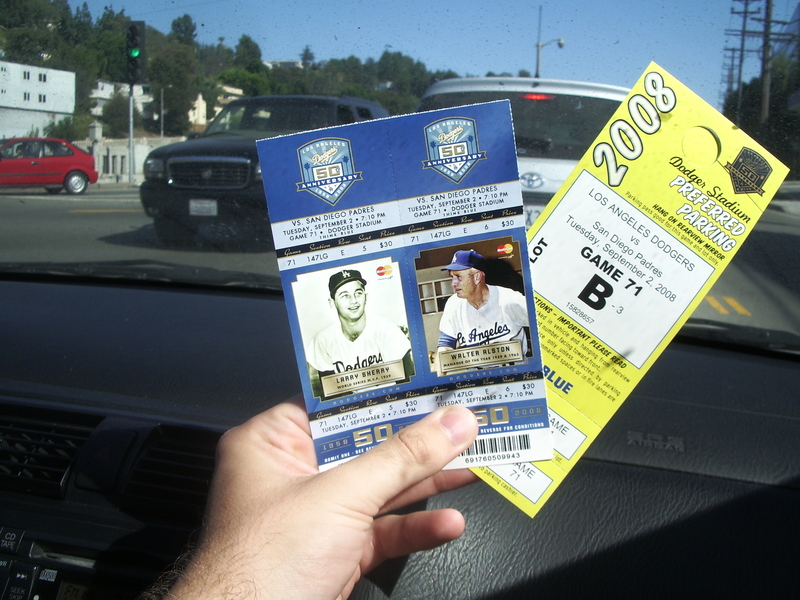 We had a Preferred Parking Pass that we got along with our tickets via uclaterry on eBay… a new favorite seller of mine. I would have preferred Field level seats but Josh was buyin’, so I couldn’t complain. We parked in the lot and hurried down to the left field bleachers. 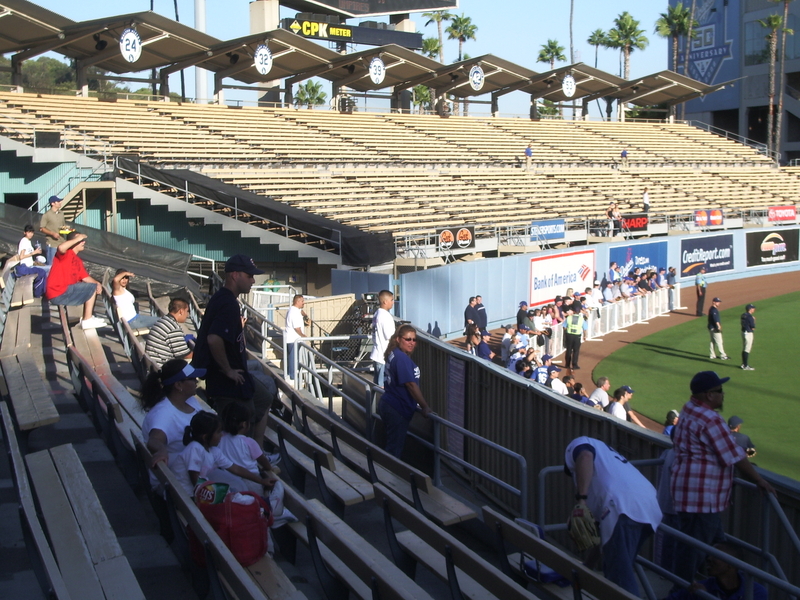 The Dodgers have an interesting approach to BP: they open up the field. 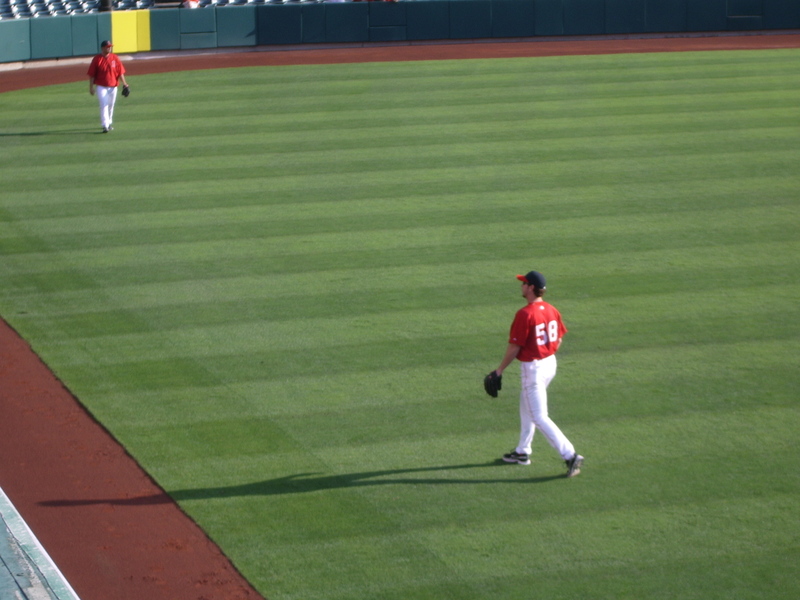 Like, you can stand on the warning track in center field and try to snag. We determined that would be way too crowded, though, and that more balls would head for the seats in left anyway. 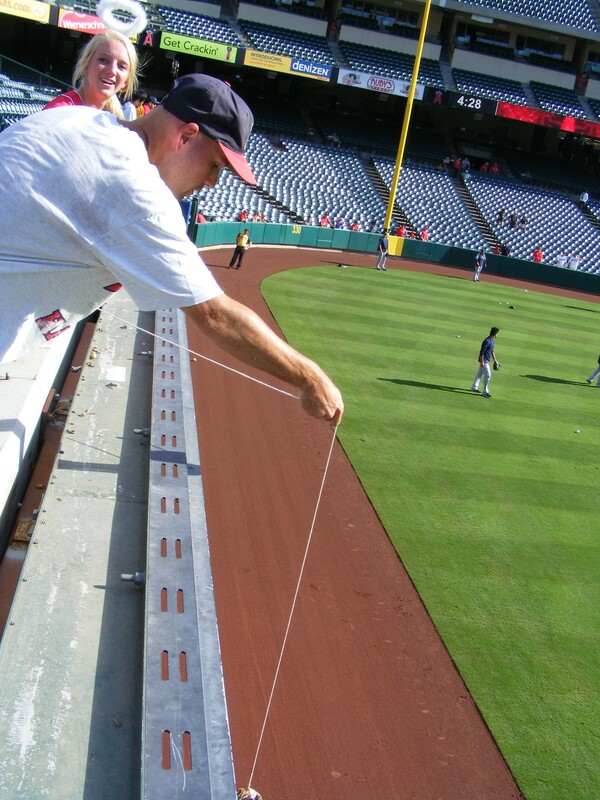 Well, we must’ve been right on because as soon as I headed up the stairs to the stands I saw a guy in a Padres cap and shirt wearing his glove just waiting for a ball to snag. I had to do a doubletake, but sure enough, it was Mr. 3700 baseballs, Zack Hample. I watched him for a second and then introduced myself. He was cordial, but hard at work, too. He seemed like a cool guy and had a very firm handshake. I told him that as soon as he had some time I would love to have him sign my book and he said he, of course, would be happy to. As I scurried along for my own snagging I kept an eye on Zack, watching his technique. 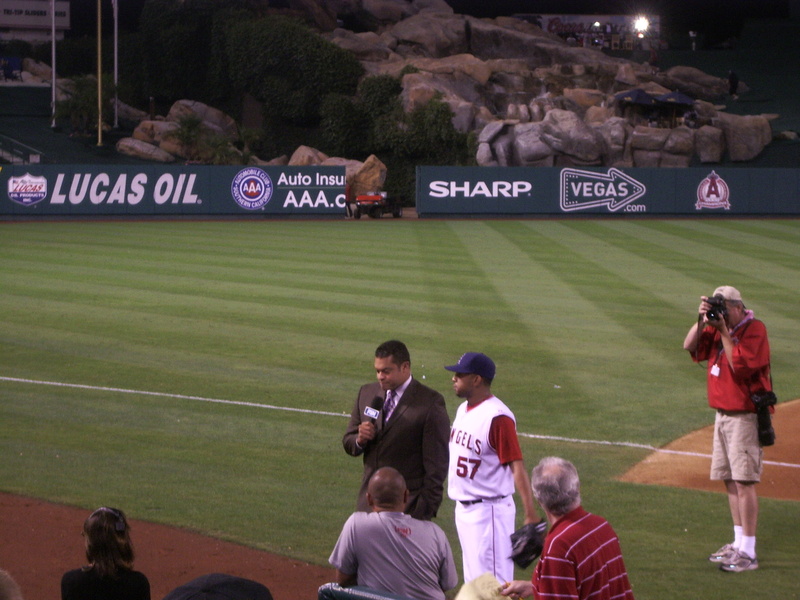 After a while I convinced Mike Adams, a reliever for the Pads, to toss me a ball. For comparison, I saw Zack snag three in that time (plus he got one before Josh and I even got there)! Later, Dodger fans started giving Zack some crap because he wouldn’t give any balls to kids. They didn’t know that he usually DOES after BP is over. Whatever. “Yeah,” he said, “but they don’t get that I give away baseballs all the time.” The guy bending down on the right side of the photo was a real jerk to Zack. Dodger fans. Yuck! And now for MY story of confrontation. I didn’t want that, obviously, but I also knew that he was probably all talk and if I stayed a few yards from him he couldn’t hit me if he wanted to. A Dodger personnel person saw it and told me he knew I didn’t push anyone. I just said to the fat dude, “Nice mouth in front of your kid.” And I was done. Who the f*** wears a red plaid shirt to a Dodger game anyway? Well, that was it for me for BP. One ball (shown to the right), but my streak was alive and well! Josh and I headed for our seats in foul ball range on the Loge. And in the first inning Juan Pierre smacked one that curved juuuuussst a little too far from us. The game went on… at one point the Dodgers were up 8-0. Manny hit ANOTHER home run. Andre Eithier had a chance at the cycle but was a double short. Most fans left after he grounded out in the 8th. And another foul came really close but was just out of my reach again. 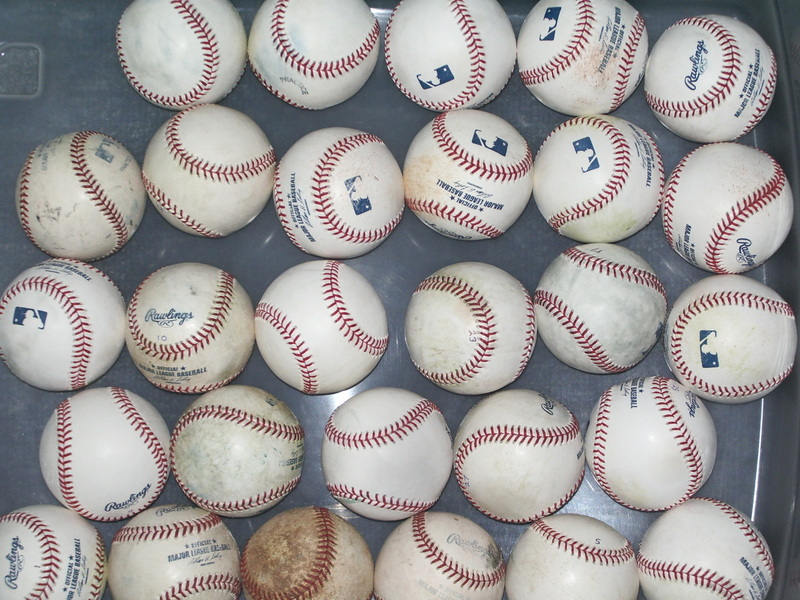 I saw Zack snag a few more balls at the Padres dugout during the game. He ended up with ELEVEN. That man is insane! The score ended up being 8-4 Dodgers. I had a great time! One of the best parts about going to a non-Angels game is that I usually don’t care who wins or loses and I can just enjoy baseball. Ah. Next up… PETCO Park on Sept. 9th! I hear it’s good for snagging. I’ll be there with my sister, her boyfriend, and Michelle. Woo!